The Firexpress mobile unit is very versatile and can be used in many different set-ups. In the standard configuration it can be mounted inside a fire engine, light rescue vehicle or forward command car, appreciated due to its compact design and ease of operation. A transport kit consisting of a handle and different options for wheel configuration can be mounted on the mobile unit. This makes it possible to move the unit over shorter distances, for fighting fires in relative close proximity to the location of the unit. This mobility of the system makes it very useful in industrial areas such as factories, warehouses, car decks and engine rooms on ships, aircraft hangars etc. The mobile unit is a self-contained system with a 50 litre tank for premixed water and foam. The system is driven by compressed air delivered from a standard 6.0 litre steel air tank filled to 300 bar. The pressure of the air is reduced to 20 bar before it enters the water tank. The air forces the water into a 30 metre hose, which is connected to the Firexpress lance. The Firexpress mobile unit conforms to directive number 2014/34/EU concerning equipment and protective systems intended for use in potentially explosive atmospheres of the European Union, also known as the ATEX directive under equipment-group II, equipment category 3. It hence comply with the requirements for safety and health protection of workers potentially at risk from explosive atmospheres in zone 2 (mixture with air of flammable substances in the form of gas, vapour or mist) and zone 22 (cloud of combustible dust) as per directive 1999/92/EC of the European Union. 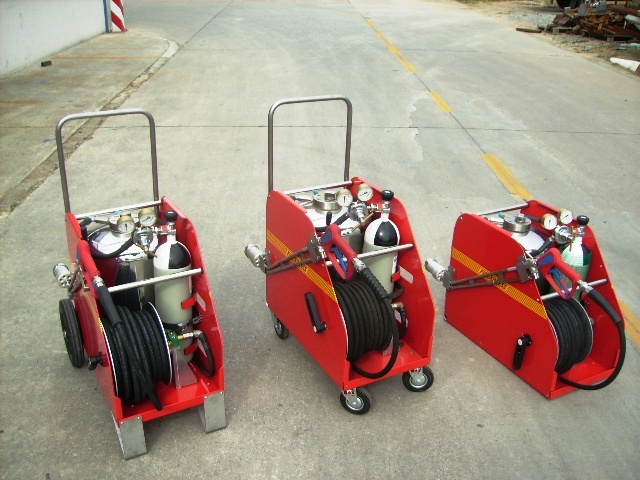 The Firexpress mobile unit with various models of transport kit and the standard version without a transport kit for fixed installation. A mobile unit installed in a light rescue vehicle of the Voluntary Fire Brigade of Ospedaletto, Italy.